Firefighters in Scotland have been called out to rescue obese people more than 100 times in just over three years, according to new figures. Statistics obtained by BBC Scotland reveal that the fire service carries out an average of almost three "bariatric rescues" a month. In many cases, they are called to help paramedics who are unable to move very sick, morbidly obese patients. One health expert warned that they will increase as "the obese get obeser." In recent years there has been an "obesity epidemic" in Scotland with almost two thirds (65%) of adults being overweight or obese in 2014. According to The Scottish Health Survey more than a quarter (28%) were classed as obese - very overweight, with excessive body fat. Tam Fry, of the National Obesity Forum, said the figures from the Scottish Fire and Rescue Service, were "no surprise at all". "The tragedy is that they will grow in the years to come," he added. "One of the most depressing aspects of today's epidemic is that, although the number of obese individuals may be levelling off, the obese are getting obeser. "These are the people having to be winched from their homes often with serious medical problems that have been triggered by their obesity." Statistics released in response to a freedom of information request reveal that 111 bariatric rescues have been undertaken by firefighters since 1 January 2013. However the real figure is likely to be much higher - as the data does not include the former Strathclyde area, where a different record-keeping system is used. The areas where most rescues took place were the Highlands and Clackmannanshire. A total of 29 rescues have taken place across the Highland Council region since the beginning of 2013; in Clackmannanshire that figure stood at 23. Often firefighters can help lift patients without equipment - but they have also used animal harnesses, a bariatric stretcher and a hydraulic winch. The fire service was unable to estimate how much each rescue cost, as "there are too many variables". A spokesman said: "While the transportation and care of bariatric patients is a medical issue, we do provide assistance to our partner agencies whenever it is appropriate. "Where we have resources and appropriate specialist skills that could assist them in the safe resolution of an incident then of course we do so." 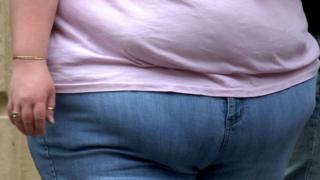 Mr Fry said action needed to be taken immediately to tackle the obesity epidemic in Scotland. "Even if an onslaught against obesity were to be made today, it will be another five to 10 years before any significant improvement will be noticed," he said. "A prediction was made in 2007 - and accepted by the government - that, by 2050, half the country would be obese. "That is the severity of the problem you are looking at."